My blender recently broke down and so frozen drinks were out for a while. 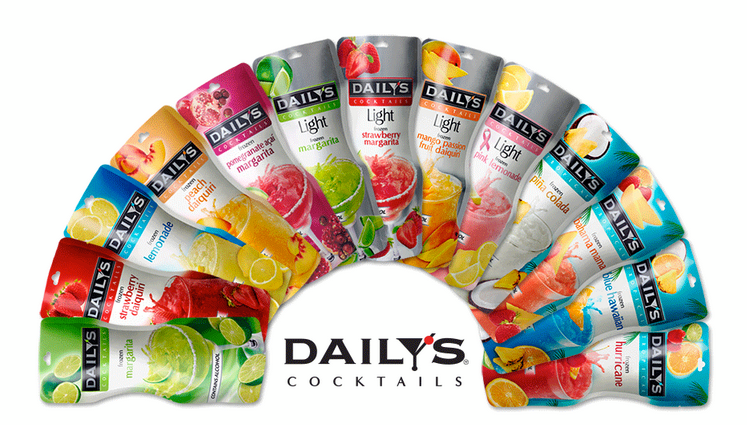 I had to run to Walmart one night and while I was walking by the frozen section I noticed a display of Daily's pouches. There are so many kinds to choose from and they all sounded delicious. I chose several different flavors to try out. I've been sick for a long time but have finally begun to feel better. A relaxing night at home with my husband, a good movie, some yummy drinks and snacks was just what I needed. So far I've tried Daily's Cocktails Frozen Bahama Mama, Strawberry Daquiri, Peach Daquiri, and Pomegranite Acai Margarita. All of them have been delicious, fresh tasting and so refreshing. I love how simple they are. I just toss the one I want to enjoy into my freezer the night before. The next night I take out a frosty glass and my pouch and give the pouch a quick squish with my hands. The top has an easy to tear open tab and then I just pour the whole thing right into my glass, it's simple. Another relaxing snack fave is salsa and guacamole from Wholly. These are easy to find in the refrigerated section of my local grocery store. Again the ease of use is the best because I've never had very good luck picking out the best avocados and I stink at making salsa. Most jarred salsas do not have the fresh taste that I'm looking for. Making guacamole might be fun but it's terribly hard to store because it turns brown and goes bad fast. Wholly has these awesome little pouches that keep their guac fresh. They are the perfect size. My fave tortilla chip to pair with Wholly products has to be Garden of Eatin'. Man their blue corn tortilla chips are outstanding! For our date night I rented a funny movie from a Redbox and we cuddled on the couch with our snacks and drinks. It was nice to not have to get all ready or hire a baby sitter for the kids. Just a simple night in with my love. You can enter to win a night in as well. Just use the form below. One winner will receive a prize package filled with Wholly Guacamole products, a $20 Walmart gift card to buy some Daily's Cocktails and other fun swag.